﻿ News Bharati - 'Bharat ke mann ki baat' in Gujarat..! News Bharati - 'Bharat ke mann ki baat' in Gujarat..! 'Bharat ke mann ki baat' in Gujarat..! 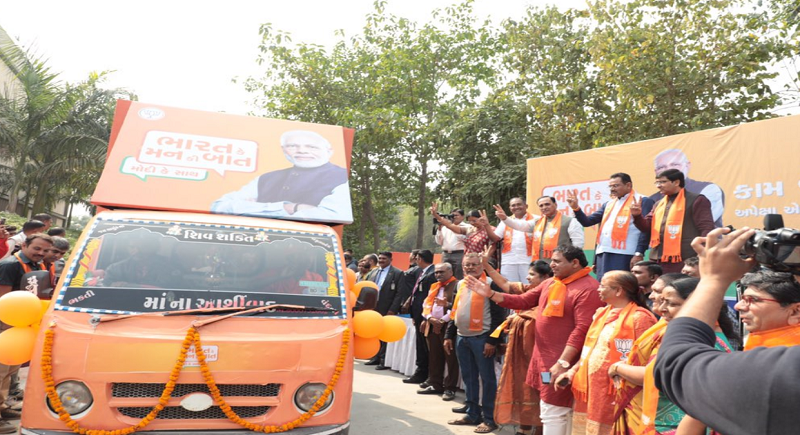 Gandhinagar, February 5: Demanding more than hundred million suggestions from people across the country for the forthcoming Lok Sabha elections, the BJP launched ‘Bharat ke mann ki baat’, after the renowned campaign vision named ‘Mann ki baat’. The state of Gujarat has once again marked itself first to initiate the party’s decision. “India's mind-with Modi programme is a programme to make the country safer, raising the living standards of every poor and realizing the dreams of new India”, said CM Vijay Rupani while inaugurating the event at Gandhinagar. “All the 26 Lok Sabha seats will reach the chariot of India's mind and interact with the people”, he added lauding the initiative meanwhile. To know the views of the people, through different means, the people will be able to contact people across the country. Inaugurating the national campaign, party President Amit Shah had said that India's mind - with Modi program will be a unique program in itself in the election process of India. Shah hailing the government had also said that the situation in the country before 2014 was as if it was going to lay the faith of people in the country's democracy. “After 30 years in 2014, the people of the country made a whole lot of government led by Modi. The Narendra Modi government has changed the situation of the country. Due to the visionary policies of Prime Minister, the foundation of long-term development in the country has been laid down”, he added.